Utah’s Pando aspen grove is the most massive living thing known on Earth. It may die soon. Fishlake National Forest • The leaves of the Pando aspen grove glow in the low sunshine of an October afternoon. The straight, vertical trunks repeat into the distance like a house of mirrors, and under a backlit canopy of foliage, Pando feels at once infinite and enclosed. For 106 acres on the southwest bank of Fish Lake in Sevier County, a single root system unites this forest. Pando is the biggest aspen “clone” ever identified, the single most massive living organism known on Earth. Though little known in Utah, Pando has gained fame as a tourist destination and as a symbol of sustainability and interconnectedness. It is being researched, photographed, talked about. It has inspired poetry, sermons, even comedy sketches. Scientists say it could be on the brink of collapse. Rogers and local land managers know the reason for Pando’s struggle: Animals are eating it faster than it can regenerate. They also say there are ways to save Pando quickly — a welcome distinction from other aspen clones in the Mountain West, which have declined under drought and high temperatures. But action must be swift, aspen advocates warn. In less than a decade, the mighty Pando — Latin for “I spread” — may deteriorate beyond recovery, Rogers says. The problem at Pando is immediately visible from State Road 25, which cuts through the clone. Near the Fishlake National Forest sign at mile marker 6, Pando looks as well-groomed as a city park. Towering trees, 100 years old, are spaced out like the columns of the Parthenon. This is not the look of a healthy aspen clone, but the tidy beauty is so distracting that you might not notice what is missing: baby trees. (Erin Alberty | The Salt Lake Tribune) A mule deer approaches the Pando aspen clone Oct. 5, 2017 in Sevier County. Pando is the largest aspen grove — and most massive living thing — known on earth, but scientists say it could die soon because deer are browsing the clone's new sprouts, preventing it from regenerating. The main culprit is mule deer. About 50 live in and near Pando and are ravenous by the time new shoots appear in June, says Jim Lamb, a biologist with the state Division of Wildlife Resources. “Consider if a deer wants to eat three to four pounds of food a day, what [happens to] an 18-inch-tall sapling,” Lamb says. Most, if not all, of the new growth is eaten, Rogers says. In fall, an annual cattle drive of about 1,000 head moves through the eastern part of the grove. In winter, a few elk show up to browse. The clone’s mature and growing trees put energy into their massive, shared root system to form new sprouts. As old trees die and are not replaced, the canopy becomes more sparse, and the entire clone becomes less able to reproduce and thrive. “When you reach the point of no return, there’s not enough photosynthesis above the ground to put carbohydrates into the root system,” Rogers explains. In a packed Ascension Day service at the historic Trinity Church in Manhattan, renowned interfaith speaker and Episcopal priest Ed Bacon asks worshippers to take from his sermon just one image, that of an aspen grove in southern Utah. Bacon drives home the metaphor. In September, Bacon joined a tour organized by Pando Populus, an environmental sustainability organization that named itself for the clone, though it is based in California. A TED-like assembly of more than 30 of Pando’s biggest fans — from famed south-central L.A. “gangsta gardener” Ron Finley to celebrated theologian John Cobb — traveled from around the United States to walk the grove, meet locals and learn how to best save their beloved icon. Pando is mentioned only in passing on the state’s official tourism site, but its fame is spreading fast. About two years ago, staff at the Fish Lake Lodge and Lakeside Resort suddenly saw an influx of tourists asking to see the clone, says Stephanie Moulton. “We’re getting a lot more foreigners especially, and it’s interesting how many of them are asking about Pando,” Moulton says. On a bright morning in October, videographer Kyle Niemer bounds through Pando wearing a deer costume. He is stopped by Brad Einstein, a Chicago-based comedian who has toured with Second City and now films comedy videos to promote conservation. (Erin Alberty | The Salt Lake Tribune) Comedians Brad Einstein and Kyle Niemer perform for a video of comedy sketches about ecology — or "silly bits in the woods," as Einstein calls them — on Oct. 5, 2017 at the Pando aspen clone in Sevier County. The team, from Chicago, is producing the video as part of a fundraising campaign for interpretive signs at Pando, the largest aspen grove and most massive living thing known on earth. Einstein says he decided to feature Pando after he visited earlier this year and found that the largest known living organism on Earth doesn’t have so much as a sign to let visitors know where it is. The video was intended to support an online fundraiser for interpretive signs. “He coulda had more fun,” Einstein agrees. During their week of filming, Einstein’s crew wonders whether stopping the deer is more urgent than signage. Rogers in January published research that shows Pando could make an extraordinarily fast recovery — with a little help. He and other researchers fenced 15 acres and tracked growth for three years in multiple plots, some inside the fence and some outside. The rate of regeneration quadrupled inside the fence, with many individual stems growing taller than deer would be able to reach. But Rogers says fencing is an imperfect solution. The U.S. Forest Service has put fencing in Pando before, circling about 40 acres west of the road in the 1990s, Rogers says. But deer soon breached the fence and now that area is not regenerating much faster than the unfenced area. Fencing has improved in the 25 years since then, but it is costly. The 8-foot-tall fence around Rogers’ study area, which has gates for public access, costs about $5 per foot of length, estimates Jody Gale, rangeland agent in Richfield for USU Extension. That’s about $22,100 for the 15 acres now protected. The entire perimeter of Pando is about 12,000 feet — or $60,000 worth of fencing. “If [volunteers] have to do a GoFundMe just to get a sign, how will [the Forest Service] afford a project like this?” Rogers asks. He also worries that fencing will be an unsightly addition. On a fall Friday, Pando draws a small crowd of about 20 hikers and photographers. The blue sky, the golden foliage and the white bark gleam with the brightness of a marching band uniform in a laundry detergent commercial. And in the background is an 8-foot wall of beams and poles. Temporary fencing that rotates through the grove could be a smaller-scale option, but ultimately, Rogers says, the ungulate population is the problem. He wants the DWR to facilitate more hunting, which is largely restricted due to roads, cabins and homes within Pando, and laws that ban hunting within 600 feet of those sites. Even with more hunting, he says, Pando would probably be popular with deer. Hunting also doesn’t resolve another concern at Pando: Deer aren’t the only animals who want to eat it. “Yah! Yah!” shouts Darren Nelson as he chases a cow out of a meadow above Fish Lake and then stops, leaning forward in his saddle. 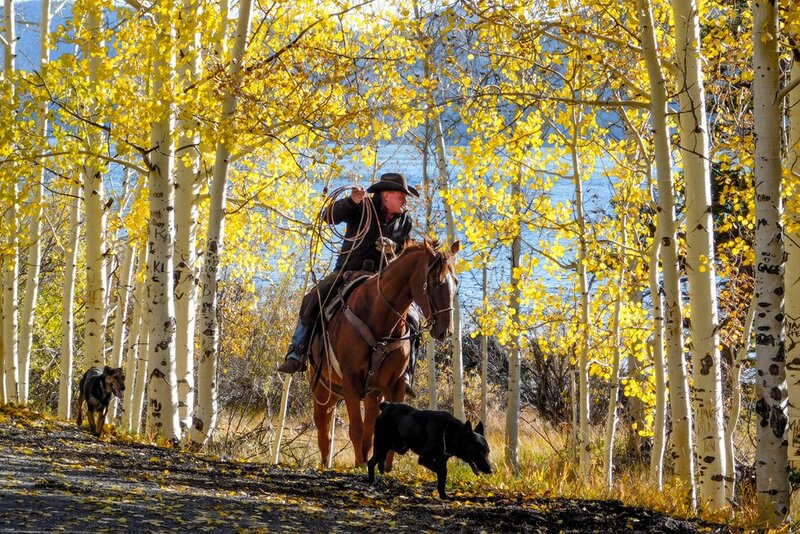 He has a Carlsbad hat, spurs, a lasso, a neckerchief and a holler perfected over decades on the range. (Erin Alberty | The Salt Lake Tribune) Rancher Darren Nelson drives his cattle along Fish Lake on Oct. 6, 2017 in Sevier County. His herd of 1,100 spends about 10 days grazing near the Pando aspen grove. His 1,100 head of cattle have made their annual drive to Sevenmile Creek and are returning to Nelson’s farm near Loa. He and his sons are chasing a few that got antsy and are trying to head south early. “They know it’s getting close to home,” Nelson says. He is a fourth-generation rancher, and his grazing allotment goes through Pando. His family has followed this route every year since the late 1800s. The herd moves down State Road 25 in a massive, mooing parade, cowhands yelping and dogs circling. The cattle settle into the grasses south of the lake, and a few meander into the aspen. They’ll stay there for about 10 days, Nelson says. Rogers and Nelson agree that the deer leave few tender sprouts for the cattle, but also that the cattle would probably eat more if given the chance. They also could trample new plants, Rogers notes. Nelson says the cows generally prefer grass. He points out that his family’s cattle were moving through the clone back when today’s towering trees were new sprouts, so they seem not to be a variable in Pando’s present crisis. He gave his approval to the fences used in Rogers’ study even though they blocked part of his allotment. He’s also been working to keep the herd below Pando — something they’d have to get used to if more fencing were to be erected. For now, no intervention is underway, says John Zapell, spokesman for Fishlake National Forest. The Forest Service has tried burning and cutting parts of the grove, which can stimulate sprout growth, but Rogers’ study showed that had little effect outside fencing. Public interest in Pando depends largely on its superlative uniqueness. Until scientists in the 1960s began to investigate the grove’s genetics and established it as the biggest, it was seen as just another stand of quakies. It is not more or less ecologically important just because it happens to be the most massive known organism (though not the most voluminous; that title goes to a giant, tree-killing fungus in the Malheur National Forest of eastern Oregon). Rogers sees Pando as a test of people’s will to take action toward sustainability — a “canary in a coal mine,” he says.